Let me tell you- this whole Christmas in a No Sugar household business? It is not for the faint of heart. But before I begin, I’d just like to issue a formal declaration to all friends and family members: you may not, repeat NOT use the following information as ammunition to forward your argument that I am off my gourd and have been for the last, oh, say, eleven months or so. If you are helpfully wondering if I would like to talk about this, the answer is no. If you make the ill-advised decision to taunt me with quotes from this essay, I promise to sing “Hark the Herald Angels Sing” loudly until you cease and desist. Listening to me sing, as many of you already know, does not promise to be a very pleasant experience. You have been warned. But… the holidays are coming– and I mean this in the most ominous way possible. Sometimes, it feels like we’ve been in training for the month of December this entire year. Christmas– the mother of all sugar holidays, the most fructose-laden of them all: more than Thanksgiving, which is a limited, one-day-only gluttony, more than Halloween, which focuses almost exclusively on the kids, more than birthdays and Easter and Valentine’s Day combined… As the dozens of mail-order catalogs arriving at our house every day clearly confirm, Christmas, for many of us, is about celebrating the birth of Jesus through a month-long marathon of sweets, treats, cookies and cake. But that’s not what bothers me. What bothers me is the dread that my children are already expressing at the prospect of facing a sweet-restricted Christmas. Sure, we’ve discussed that Christmas itself will be the day we have our “special dessert” for the month, and that otherwise we can use dextrose to make versions of our favorite traditional treats… but on this account my daughter Greta refuses all attempts at consolation. Her entry goes on to lay the blame for her situation on David Gillespie, the author of Sweet Poison, from whom I’ve derived so much inspiration. (Sorry David!) As we were getting ready for bed I tried telling her that Mr. Gillespie is actually a very nice man, and remind her that he has six children of his own who also avoid fructose, including one daughter just her age. But Greta isn’t having any of it. “I hate it! I hate it! I hate it!” she explodes, pounding her fists on her mattress. Her eyes are shining with tears. 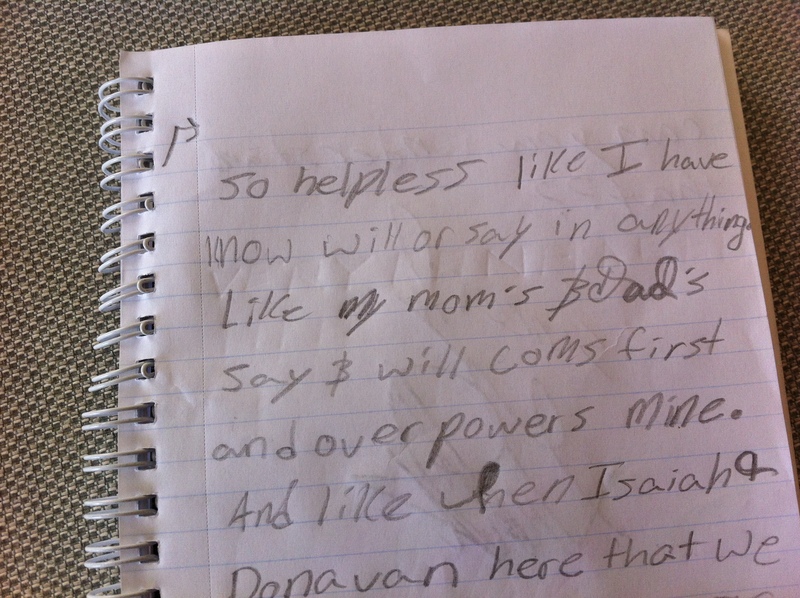 Now, you may not be aware of this, but my eleven year old has a bit of a flair for the dramatic. (Perhaps it’s our retribution for naming her Greta- as in Garbo.) But, believe it or not, this is by far the most displeasure she has expressed with our No Sugar Year to date, and I have to admit I was a bit taken aback. Of course, I hate the idea that “my” project is causing them angst, sadness, ridicule at school… but I knew there had to be that side of it, didn’t I? Didn’t I? While Greta’s outburst worries me, Ilsa worries me more. Ilsa is six. The other day we were buying sandwiches at a local shop when she reached out her hand curiously to touch a bowl of something on the countertop near the coffee carafes. When Greta suddenly warned her “That’s sugar!”, she actually flinched. “Really, honey?” I stopped what I was doing and looked at her closely. “Yeah.” She looked at me a little seriously, a little incredulously, as if to say, What, you didn’t know? SO it’s been a busy night around here tonight! (What with me color coding my Mildred Pierce coat hanger collection and everything…) Directly following the “I hate it” episode, I took a de-e-e-e-e-p breath and asked both girls to look at me from where they sat, half-tucked into their comforters in their parallel beds, each with it’s own sizable coral reef of stuffed-animal life-forms. “Listen. I want you to know. I know this year has been really, really hard. And I want you to know how much I appreciate the fact that you’ve gone along and done this project with me all year long. And it’s almost over- the really strict part. It’s almost over.” I feel like a broken record, even though I mean it. Is there really nothing I can do to assuage this sadness/anger/pain I have willingly invoked in them? Will words- in which I put such complete faith- really fail me? Suddenly, as if on cue, Greta raises her index finger in the air, in a dramatic professor “Aha!” pose. I smile. Now, that’s more like it. You’re all doing a fantastic thing. And your kids are going to come out of it just fine. Don’t forget that. Kids are incredibly resilient, and all you have done is deny them sugar for a year — in a very supportive and encouraging way, at all times. I hope you will never look back and regret doing that to them! I wish you the best of luck with Christmas! I’m able to mostly avoid the Christmas crazies by living with a fellow non-sugar friend, and by only having one must-attend family dinner, about which I have already dictated in detail my dietary requirements, and for which I will be cooking the main dessert to make sure they’re kept. That makes things easy for me, but I’m just one person, with very little family ties… I can only imagine what an event it’s going to be for you! I wish you lots and lots of luck. P.S. Thanks for the glucose syrup heads-up recently! I promptly went looking and found some at the supermarket and I’m delighted with it! Thank you Cassiel! Your posts always brighten my day and make it all feel worthwhile. Isn’t that syrup great? I recently used it in some oatmeal bread in place of the called-for honey and it came out great. our Christmas (which is on this Sunday and for 20 family) I haven’t made everything ‘sugar free’..I wouldn’t know where to start with Christmas Pudding etc. I am the one who will not be eating a lot of it…and it doesn’t worry me at all! the headache I would get if I did indulge would certainly worry me..
have a wonder-filled Christmas..you may stay with the ‘sugar-free’ in 2012…but perhaps not your children so much. What’s that they say about the darkest hour being just before the dawn? I continue to be impressed, and awed, at your perseverance in the face of the most powerful power there is known to man: pester power. Greta Garbo, eh? Things are starting to make sense. Thanks for reminding me about the dawn part- it’s easy to get myopic and forget about that bit. Wow. This is so inspiring. It’s really hard to take away sugar especially from kids. Harder even than taking it away from ourselves sometimes! You are currently reading A Year Of No Sugar: Post 88 at Eve O. Schaub.